Gorgeous Home for Family Reunions and Large Groups. 8 Bedroom house, 3.5 Bath (SLEEPS 24).2 oversized garages and no gravel. 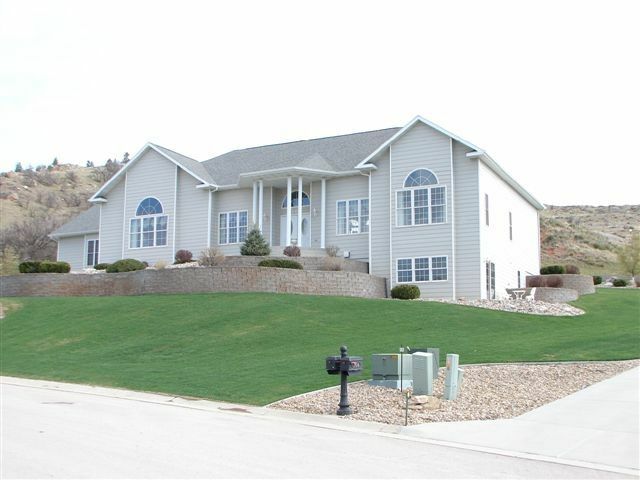 This beautiful home is located in Sandstone Estates in the picturesque town of Spearfish. The home is 7,800 square feet and the garages are perfect for the bike and classic car lovers. They are finished garages with 2,500 square feet of space. There are three levels to the home so even with a lot of people you can still find some space for alone time. The main level has the huge laundry room, family room, kitchen, half bath, living room, study, master bedroom-bath, and dining room. The top level has a loft area with beds, family room with queen bed, 2 bedrooms, a room off one bedroom with a crib, changing table and baby swing, and Jack and Jill bath. Lower level has large game room, 4 large bedrooms, bathroom, and sunroom with outside small patio area and views of the hills. We charge $850 per night except for Bike Days, Special Events and Holidays. Bike days 2019 is $1500 per night. Please email for a quote during Special events or Holidays. We sleep 24 people. This home is very clean and has beautiful furnishings. 2 coffee pots and a pump pot. Table seats 6, has an extra leaf. Pool table, bar with two high top tables and chairs. Lower level has a toy closet with lots of things to play with. House is on three fourths of an acre. We are about 15 miles from Terry Peak Ski Resort. We can see the golf course from our front door. Great place to stay during rally week. Well situated ,close enough to Sturgis but far enough to be away from all the action.The accommodations worked very well for our group and the house has all the amenities we needed and more. The inclosed garage was big enough to store our 10 motorcycles . Definitely would stay there again. The comforts and amenities of this home helped make our family reunion even more special. The private back patio was perfect for our large group to sit out doors barbeque and enjoy the evenings. The kitchen was well equipped and made for easy meal preparation with many cooks. We had kids ages 19 - 5 and it was a perfect house for playing hide and seek ping pong, and watching movies. The home was very clean, and a very relaxing place to "just be". Thank you to the owners for their help in making this special home a great place for reunions. Thank you for your kind words, Evelyn! We were so happy to hear that your stay in the Black Hills was a success and the house met your expectations for your large group! We appreciate your feedback and are happy that your family reunion was a memorable one. Thank you! So much space for every family member! Pictures do not do this home justice. The home was super clean and very well decorated. We rented it for a family reunion and it was way more than we anticipated. Plenty of room to spread out and have quiet time if you need it and great corners for the kids and teens to "hide out" in. The kitchen was well equipped and we prepared almost all of our meals in the home. The backyard had plenty of seating, it was quiet and shaded most of the day, we enjoyed the outdoor fireplace each night we were there. All the beds were comfortable and everyone slept well. I was relieved to see NO bunk beds.. so many rentals put in bunkbeds and I have worried which family member was going to be the unlucky one to sleep on the top bunk in previous homes my family has rented. Also the convenience of the location of this home... from your Walmart down the road to an easy drive to Deadwood, quick access to the interstate to tour the Black Hills. My family will definitely be back! We had a wonderful time in this beautiful home. It was great to have so much room with such a large family. We had card games going upstairs and downstairs, someone playing pool and others watching TV all at the same time! It was also nice to have activities so close, some went snowboarding and others went to the rec center for a basketball game while others went shopping. This house is gigantic and amazingly clean and comfortable. You can find lots of games to play downstairs and plenty of space to lounge around in. The view of the hills is also very enjoyable. I would recommend this for family get-togethers. Perfect for a large group! Our family all met up at this wonderful home for a few days to celebrate Christmas and we could not have chosen a better place. It was HUGE, CLEAN and TONS OF FUN for the adults and the kids. Our kids especially liked the loft room with all the twin beds and the massage chair. :) I hope we can return every year and rent this same house - we thoroughly enjoyed our time there. We have rented many places on VRBO and this one is our favorite one so far! Water park downtown, we are very close to golf course, entrance into Spearfish Canyon, bike trail that goes through the city park-fish hatchery-along Spearfish Creek-through town. Wal-Mart--Applebees-Culvers-Subway-and exit 14 I-90, Young Center-pay as you use recreation center with basketball court, swimming pool and work out, gambling in Deadwood is 13 miles away, and minutes away from hunting and hiking trails.